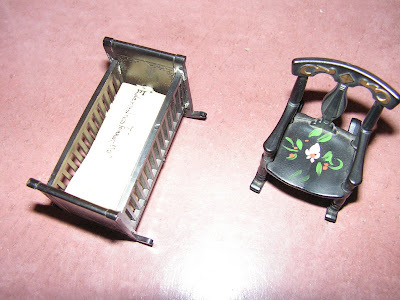 These miniatures, a crib with a molded baby, and a rocker were in a box with my doll collection. They are marked, in script, with The Enchanted Forest, a fairy tale-themed amusement park that has been closed to the general public since the early 1990s. We used to go there as kids. The guy who built a lot of the cool rides and stuff (like the Shoe for the Old Lady and the Teacup Ride) had a workshop right next door to where my dad worked. It was really neat. Anyway, I’m not sure how I ended up with these miniatures, but they made me smile. those are so sweet, Wendy, and look like they are in good condition.